This trip has been on Cathal´s hit list for some time now …thanks to Outside magazine…fellow subscribers will understand! We managed to latch onto a trip out of Dangriga in Southern Belize, facilitated by Island Expeditions, a Canadian company. We would have gone with a local company if we could, but none exist offering the type of trip we were looking for. 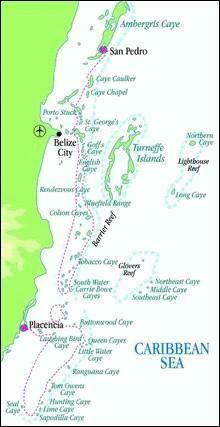 So, we had signed ourselves up for a 6 day trip around the Coral Islands, within the Belizean barrier reef. Exciting! Dangriga has not seen much tourism to date, there were very few gringos around. Any that do make it to Dangriga are using it as a jump off point for ferries to Tobacco Caye and Honduras. In our short time there we found it to be very much a local Caribbean style town, where people talk in a way you thought only happened on Lilt ads. 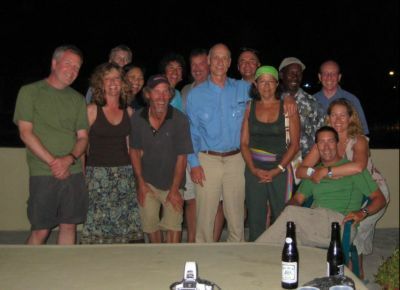 We were set up in the office with the required drybags, snorkel equipment and sleeping pads, and headed out with the rest of the gang (10 others) out to Tobacco Caye, our spot for the first night. Our fellow campers consisted of Richard & Julie from North Carolina, Real & Patricia from Ottawa, Bob from B.C., Aaron from Toronto, Peg & Greg from Oregon and Cecelia & Harvey from Calgary. Tobacco Caye is a tiny island that holds seven small resorts consisting of cabana-style huts. We made ourselves at home, got the run down on the trip from Dave our guide, and got to know our new friends! We spent the next 5 days on a circular trip, starting at Tobacco Range, heading south to South Water Caye, Billy Hawk Caye (for 2 nights) and on to Thatch Caye. Our first night camping was on Tobacco Range. Here we tested out our kayaks and got familiar with the mangroves. Wind was our friend here, on this island dubbed Sand Fly Island. Sand flies are tiny peppergrain sized flies that swarm in their thousands when there is no wind. For the most part we escaped due to lovely warm winds, but on several occasions calm weather brought consternation as the flies descended. There is no such thing as paradise…the only way to escape was to head out on the water, be it on the dock or in the kayaks! Our days started early, 6.30am was the call for freshly brewed coffee, taken in the early morning sunlight. Dave cooked us up hearty breakfasts each morning. Then it was down to work..either striking camp to leave the island or getting ready for the day´s outing. We all got more efficient as time went on. Day 2 of kayaking involved kayak-sailing. The group got a quick intro to sails and sailing jargon, then they were hoisted up and we were off! Those of us in single kayaks with no sails either got towed or got a good work out trying to keep up! There were just 2 capsizes, luckily more entertaining than trouble, and everyone enjoyed the experience. I (Jane) managed to find myself totally alone at one point – the sailors having forged ahead and the second capsize holding up Cathal and Dave the guide. I managed to ground myself in the middle of a lagoon, had to relaunch and try to guess what way the others had gone! I arrived to Billy Hawk Caye with little trouble thankfully! We stayed 2 nights at Billy Hawk Caye, a small island, our furthest point south. A local family runs a small bar and a few rooms for rent. The island is mostly reclaimed – locals dredge sand from the sea, dump it in the mangroves, and within about 20 years have a sizeable island. We set up camp on a sandy peninsula and ordered a nice cold beer to enjoy in the setting sun on the dock. Late afternoons and evenings were time to set up camp, chill out and wait for Dave´s delicious dinner! The first night on Billy Hawk a storm blew in, nothing compared to the hurricanes this region sometimes suffers but rather feisty when sleeping under canvas! It did blow away all the sandflies though! This interrupted our plans somewhat the next morning as it was too rough and windy to kayak, I think secretly people were rather pleased. The late afternoon brought calm, so we headed out for a spin, to Kaya´s Reef where we snorkelled. The shallow depth, scorpionfish and fire coral prompted Dave to pronounce the snorkelling trip a little out of control! We did manage to harvest a couple of conch to have with dinner though. A few of us enjoyed a bit of kayaksurfing at sunset on the way back to the island. Our last stop was Thatch Caye, a small island on which a high end resort is being developed. We camped at one end. At this stage, I was dying for a shower, so resorted to taking my shower gel into the sea for a saltwater scrub, followed by a quick freshwater rinse from my water bottle! We all enjoyed pinacoladas in the posh resort bar, in fact one couple took advantage and booked a room for the night, no more camping for them!! It had been a hard day…a morning of paddling into the wind and waves and a long afternoon on the water too. We paddled back to Tobacco Caye on our final day, stopping at Man-o-war caye, a bird sanctuary, to spot the Frigates and Brown Boobies (no bad jokes please! ), before getting a lift back to Dangriga. The trip finished with dinner at a local family´s house in the town. We should have been partying the night away, but instead the fresh air took its toll and we parted company by 9pm! To see these photos in larger size, just double click on the relevant photo. Enjoy – we did!